Student Voter Registration Day was a big success at Sinatra. On Monday May 21, 2018, Frank Sinatra School of the Arts (FSSA) were students given an opportunity to have their voices heard. Those who were 18 years of age, or would be by November 7th, were given the ability to register to vote. The majority of the students involved were FSSA seniors, and were given forms to fill out in their economics classes in order to have their say in upcoming elections. Many students took full advantage of this opportunity and are looking forward to being able to have a say in these decisions. “I want to have a say in our country’s fate. Being able to register here, today made it so much easier,” says senior film student Carmela Ruiz. 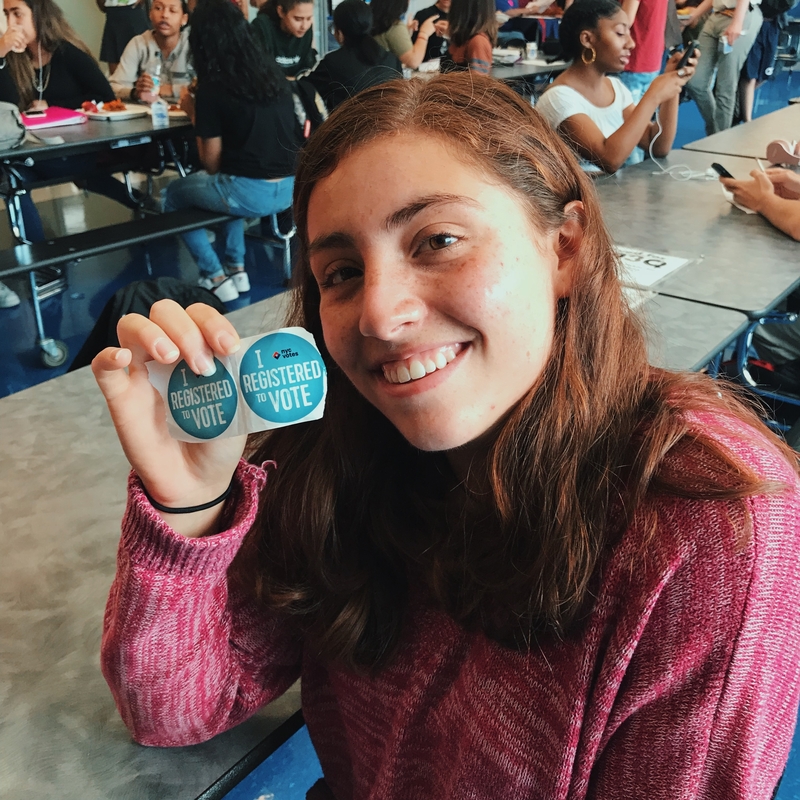 Senior Carmela Ruiz registered to vote because she believes having a voice is important. 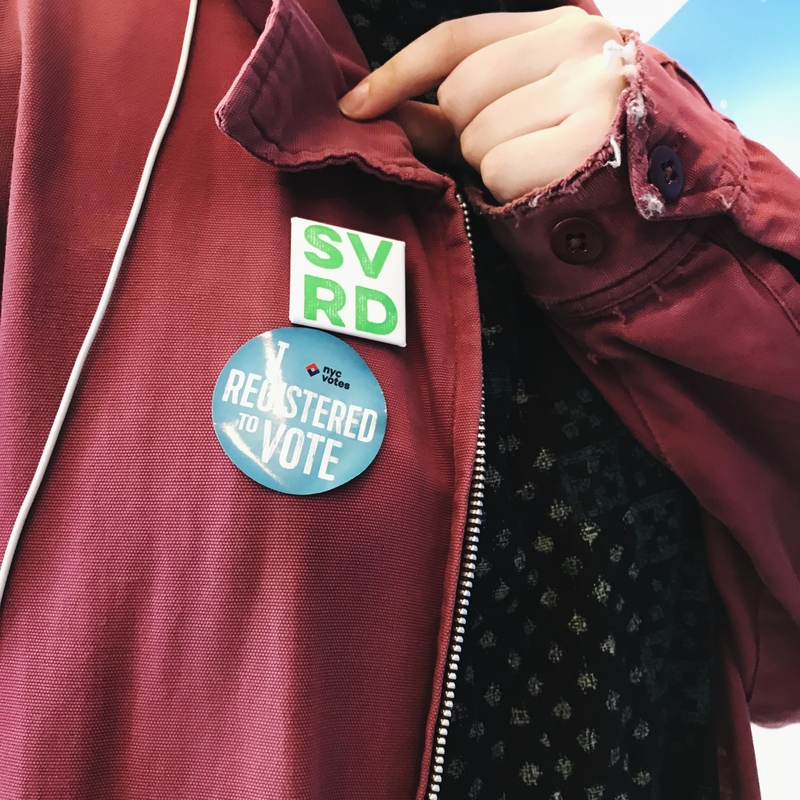 Once students received a sticker they also got a pin that read “SVRD” (Student Voter Registration Day). Needless to say, the stickers and pins were a big hit throughout the building. Not only were students excited about taking this next step in their lives, but teachers were ecstatic as well. Having the opportunity to register in schools gives students that extra push to not put off signing up. “As a government teacher I find that voting is the most powerful weapon that the government hands us. People, especially teenagers, give excuses all the time that they don’t want to take the time out of busy lives to go register, but us being able to give this opportunity to you makes it that much easier for your voices to be heard,” states Mr. Lange, an FSSA social studies teacher. By far one of the biggest supporters of SVRD was the principal, Mr. Frankel. He added what he thought about the day and what this means for future generations and the students of our community. “There’s so many people that don’t exercise their right to vote. So many people fought for this right and not enough people exercise it. This makes is eligible to share what people are thinking, younger people will not feel like their voice is pushed aside,” Mr. Frankel said. “I’m hoping the next generation creates a compromise instead of having two polar opposite sides. I think it’s going to take some smart organized people to vote. If you don’t use your right to vote then you don’t really get a say when something your government does something that you don’t really agree with. Now you can use your vote to change that,” he added. Though this event was targeted toward seniors, talk of it made its way around the school and got other students excited for this opportunity in the following years to come, so that their voices can be heard as well. FSSA Junior Greta Rustani shared why she is looking forward to this opportunity next year. “I don’t want another Trump. I feel like the younger generation has the right idea of what is good for the country, and that we can help change it for the better,” Greta said. The excitement continued to spread throughout the school, and now underclassmen cannot wait until they are seniors for when this day arrives for them. FSSA continues to help students strive for greatness, and this envelope they fill out makes them feel somewhat more powerful because their voice will now be heard.